When I think of borrowing something the first thing that comes to mind is the library. Libraries are a great tool in the frugal mom’s belt. When we decided to get out of debt and change our financial future I didn’t go on Amazon and buy twenty books about money, I went to my library and checked them out. Many libraries also have computers, internet access, DVD’s, CD’s, magazines, and newspapers all free for us to use. Some libraries even have toys you can check out. We have not rented a movie in over two years because we check them out from the library. But what if you need something other than media related items, what do you do? In society today, our first reaction is to run to the store and purchase something that we need. But, if we only need the item for a one time use that is a silly way to spend money. Perhaps we are considering purchasing a big ticket item. Borrowing this item for a week or so will help you decide whether purchasing it makes financial sense. After developing relationships with your neighbors you are likely to know who is willing to borrow back and forth. Shortly after meeting our next door neighbor he told us he was a movie buff and owned hundreds of movies. He also told us we could borrow whatever we liked. We waited a few weeks and got to know him a bit better before we borrowed a movie from him. Decide whether the item needs to be borrowed. Don’t start making cookies if you need half of the ingredients. It’s one thing to borrow an egg, it’s another to borrow two eggs, three cups of flour, and a teaspoon of vanilla. For example, I am making cookies and I need to borrow a teaspoon of baking powder. It would better to supply your neighbor with a plate of warm cookies than come by three days later with a teaspoon of baking powder inside a Ziploc. For most food items though, it is better to replace the item. Punch bowls, extra chairs, steam cleaning vacuums, are a few items that if you only need once a year it would be better to borrow rather than purchase. We don’t own a tall ladder. We need a tall ladder about twice a year. A ladder costs between $50 and $800 dollars depending on what type you purchase. It makes more sense for us to borrow a ladder than to purchase one. Now, if we needed a ladder once a week, we would purchase one. Many people have tons of baby equipment taking up space in their attics, basements and garages. When our third child was born we didn’t have a crib so we borrowed one from friends who weren’t using it at the time. Many people are happy to share these items and get them out of their storage for a while. Return it quickly (obviously this isn’t the case for baby items). Return it in better shape than when you received it. If you are borrowing something every week you probably need to own it outright. If you break it or damage it, replace it right away. Be willing to share your stuff too. I have loaned friends and neighbors everything from a cup of laundry detergent to a car that we weren’t using at the time. I have borrowed everything from a teaspoon of caraway seeds to costume jewelry and formal wear. 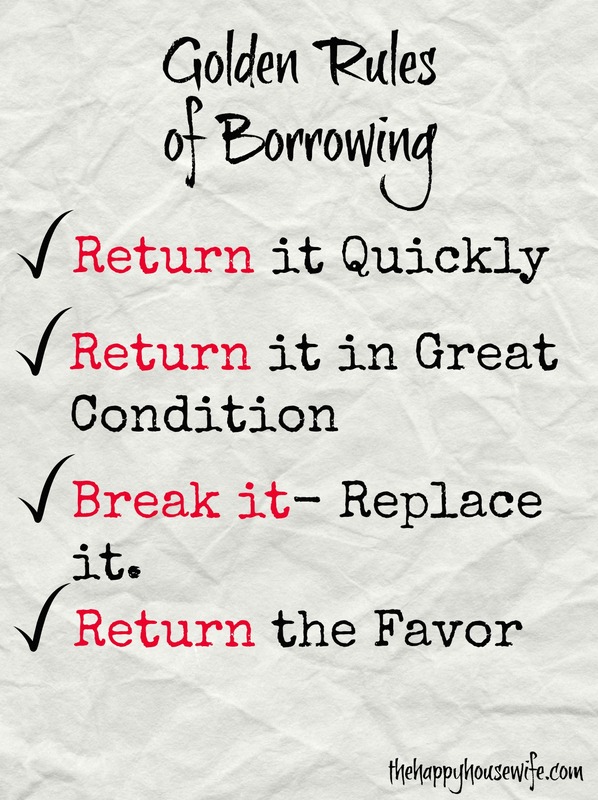 Borrowing items is a great way to save money. Not only do you save money by not purchasing items, but having less stuff allows you to be more organized. Being organized saves money because you know what you have and where it is, so you don’t duplicate purchases. Borrowing also deepens relationships with our friends and neighbors. I love to share my things with others. I feel great about helping someone, especially if it allows them to reach their financial goals by spending less. I agree. It’s always nice to have friends you feel like you can borrow from. And to be one of those friends people feel they can borrow from. It saves everyone time (going to the store) and money! This is a great tip! I was thinking that we needed to buy a ladder the other day but hated to spend the money on something we only use a couple times a year. It make a lot more sense to borrow it!! Thanks for the tip! I love this site 🙂 I was just told about it. So I have some catching up to do. Kind of funny that I heard about your blog. I have been thinking about you and your family a lot lately!!! I read something somewhere to keep a list of things you borrow and to whom they belong and keep a list of things you loan and to whom. That has saved my brain! I really enjoyed this post, it reminded me how very blessed I am to have good neighbors and friends to borrow with. I just need to train myself to remember the borrowing option, rather than just flying off to the store. As far as the library, my husband reminds me that it is not really free if you pay the librarian’s salary for the day in late fines every time you go. I need to get a little more organized. I am coming back to your blog soon! I am so glad I found you on the homeschool lounge… you are the queen of all things frugal it looks like, and the info here is great! You have a very well-written post here. We have some good neighbors with whom we borrow back and forth. It is such a blessing. That was a wonderful column. It reminds me of how blessed I am to have several neighbors that I can borrow things from. Hey, this is a wonderful post. We often look some of the most frugal options by not reaching out to others! Great blog on Borrowing,I will be looking for more.BorrowerBill. Great tips!!! We had a neighborhood that was the best ever! 4 of our closest friends lived within 8 houses. It was great! One had a miter saw, one had the extension cords, one had a ladder, etc, etc. Each of us had different keys to different peoples houses and we felt comfortable breaking in if needed!!! I’d even get a phone call at work….I just borrowed a cake mix….hope that was ok or I borrowed some milk…I knew you’d have it. I even had to walk a pan of cookies down the street to bake b/c our oven went out. Boy do I miss that! I think, being a military mom, that the art of borrowing (and lending) has become second nature. We had great sponsors early on who lent us literally everything (our first move had a nightmare shipment story) and we’ve tried to pay those favors forward ever since. It’s hard to develop a truly generous heart and accept that some things you lend won’t come home. I admit freely that I don’t lend out irreplaceable items, because of this, but I’m very happy to lend or give away all kinds of stuff. Where would I have been without LouAnn’s pillows? The Dents’ cat litter? The Adams’ car? My favorite lending story…we had new on base neighbors in San Vito. He was American, she was Japanese. We had the loaner lawn mower (everyone on the block used it – half the time I didn’t know where it was). She repaid us with homemade sushi. Every week. When we sold the mower, it was with the stipulation that the new owner HAD to lend it out. These are all really good tips. I have ashamed to say that I don’t even know where our local library is located. How bad is that. However, now that I have a little one…. I am wanting to check it out. She loves books. So, thanks for that reminder. Here, here to borrowing and bartering! I’ve always been a library patron, but I now hear others who’ve spent fortunes at book stores saying they’re using the public library. Our taxes support it, anyway, so why not? As a nonprofit development director, I’m become really good at bartering with companies. We give them good exposure for in-kind donations or the lending of objects. Everyone wins! We all should be more creative and open in our sharing. Great post! We have a borrowing relationship with several couples/friends, and also with both sets of our parents. It just makes sense, and it works out for both parties. We have borrowed and loaned many things (in fact I have written a post about it but haven’t scheduled it yet). We had a neighbor that borrowed our lawnmower all the time, in fact he used it more than we did (it finally broke down). The other neighbor borrowed my iron every weekend! Our neighbors across the street let us “borrow” space in their freezer chest. Their children are grown, but they didn’t want to get rid of the freezer. They don’t buy enough food to fill it. On the other hand, we have a large family and I usually buy items in bulk when they go on sale. It’s a win/win situation for us all. I get to take advantage of the sales at the grocery store, and their freezer is full, which lowers their electric bills. We used to have neighbors who would come over to borrow chocolate chips, butter and vanilla to make cookies! Are you serious? if you don’t have those go to the store! I like the rules. I’m not much of a borrower because I always have the luck of some how “ruining” whatever it I borrowed and then having to replace it with a brand new one! A very informative post on borrowing etiquette. Thanks so much for reposting this. FABULOUS post! LOVE LOVE LOVE borrowing as a way of being generous! Awesome post! Love it. I borrow too and am honored if people ask to borrow something. A friend of mine and I have been in a cooking club together for years (once a month freezer cooking) Since we have new allergies in our house and she had gastric-bypass surgery recently, it doesn’t make sense to impose our needs on others. Now we do a personal food swap and it is working great. She makes extra french toast for my freezer and I freeze extra stir-fry and we swap….constantly. I have family that lives is the house next to mine and we share a yard. My cousin comes over and borrows stuff 3 to 5 times a day sometimes more. Most of the time it’s food and cooking stuff. How do I let her know it’s rude? I don’t want to hurt her feelings, but I’m tired of her interrupting my family and using all my stuff. I have this rule..if you break it, can you afford to buy me another? if the answer is no, then I cannot loan it..
My daughter wanted to borrow my Rainbow Vacuum which new cost me $1200.00 15 years ago. But can be had for under $300.00 used if you know where to look. I was ready to let her use it, but then had this thought…wait..what if it breaks?..one never knows what could happen. I have borrowed and loaned school textbooks almost every since I have been homeschooling (12 years now). Usually one or two each year both ways. Sure saves on homeschool expenses, especially the math and science books! It’s one thing to borrow something like a cup of flour or milk – but I learned my lesson the hard way about borrowing something big. I was a single mom of two, on a teacher’s salary, and wanted to take my kids on vacation. I borrowed a pop-up camper from a friend of my mom’s. To make a long story short, on the way to the campground the camper came off the trailer hitch on the back of my car wrecking, not only the camper, but my SUV as well. Let’s just say that I spent way more to repair that camper than I would have for a week in a nice hotel with the kids, but it sure cured me of borrowing anything big!